Get your horse only the best Robart Pinchless Twisted 7'' Shank Snaffle Bit on the market. We know how difficult it can be to find a good deal on a Shank Snaffle Bit made of unsurpassable craftsmanship. 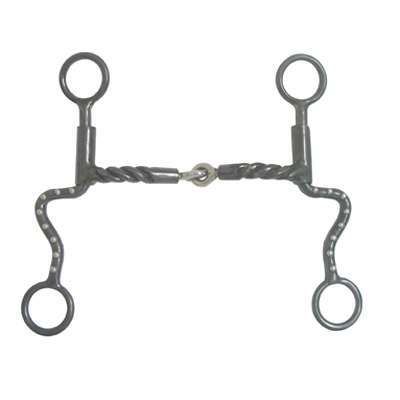 This Pinchless Shank Snaffle Bit is a pinchless twisted black iron training snaffle with stainless steel dots. Considered a 7'' shank for transition from o-ring to snaffle for young horses. For less sensitive horses with medium leverage. These exquisite Shank Snaffle Bits are also designed to use pressure and eliminate pain, instead of using pain to train. Get your Horse Snaffle Bits today at Horse Tack Now, The best place for Pinchless Shank Snaffle Bits and more.